I should be planning my holiday menu right now and writing about all the delicious dishes you can serve at Thanksgiving. Instead, I am tossing what must be hundreds of dollars worth of food - baggies of spices, brand new boxes of cereal, crackers, chips - into yard waste-sized trash bags. And my skin is crawling. Why? I saw one of these furry-looking critters on my kitchen counter and thought woefully, oh crap. So I dug into my pantry and discovered what looked like a colony of the buggers. They were having a party, and it looked like they had been at it for quite some time (that picture up there? That was our flour that was stored in a beautiful stainless steel container. I do apologize I had to show you that image. Clearly I don't bake often). After I threw up a bit in my mouth over the thought of how many we had inadvertently consumed (were there some in the baharat spice blend I'd just used in a dish?? Shudder), I started a major pantry clean out. I kept asking myself How did we get them? Where the heck did they come from? Why us?! (Well, that was a selfish question because I certainly wouldn't wish this infestation on anyone). It turns out that bulk foods are often the big culprit. Though we don't buy our food in bulk we do buy our spices from a place that imports them in bulk (as they all do). After a recent news story about contaminated spice imports I began to suspect our spices as the source, but who knows. It could have been from a bag of rice or lentils. That said, there are ways to prevent critters from invading your dry food and spice supplies and ways to easily get rid of them if you do find them. 1. Avoid buying from bulk bins. If you do, freeze the foods for at least a week (or store in the freezer) to kill any eggs. 2. Inspect packaging before buying. Make sure there are no tears in boxes or bags. 3. 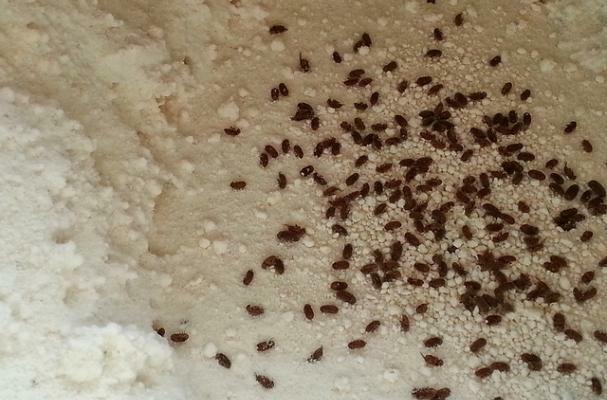 Store food in airtight containers - glass or plastic are best - that bugs can't chew through. They can get through plastic bags and cardboard in the wink of an eye, so yes, this means you must dump your cereals, snacks, flours and such into sealable containers. But think of it this way, your pantry will look so beautifully organized. And BUG FREE! 1. Get rid of ALL dry foods and spices not properly stored. Yes, it was challenging to throw away virtually my entire pantry, including 3 brand new boxes of cereal and graham crackers, but why risk it? There could be one fat-with-babies female squirreled away just waiting to spawn a new colony. Infected items, if you can't see the actual bugs, will appear clumpy like tiny little cobwebs. 2. Thoroughly vacuum the area, then immediately remove garbage and vacuum bags from the house. 3. Cleanse area with warm, soapy water or thoroughly wipe down with white vinegar. I did both! In fact, just for good measure, I sprayed the white vinegar over the shelves and walls (including down the cracks behind the shelves) and let it sit. My pantry smells like a salad but it's worth it.